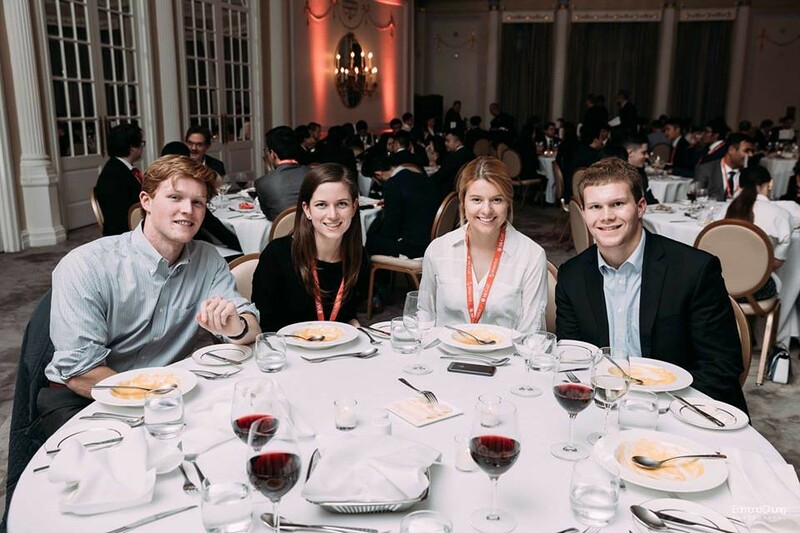 On Nov. 3 and 4, Notre Dame undergraduates Charlie Trense, Janne Fuss, Catherine Lynch and Mark O’Meara competed in the finals at the McGill International Portfolio Challenge (MIPC) in Montreal, Quebec. MIPC is a unique competition targeting innovative portfolio design and asset management, aiming to shift the focus of academic competitions to the buy-side. MIPC bridges the gap between students with a demonstrated interest in asset management and industry leaders, providing opportunities to network in the field. The participants agreed that this experience was very different from a traditional stock pitch competition. Student teams, composed of four undergraduate or graduate students, create a portfolio tailored to a client profile. Portfolios include analysis of factors that are present in the industry but not often discussed in academic settings, pushing students to bridge the gap between theoretical knowledge and industry standards. For its inaugural year, MIPC posed a case focused on a defined benefits pension plan. Participants were given documentation coming from the actuary of the pension plan, its Statement of Investment Policies and Procedures, and some details regarding transaction costs. The team was then tasked with creating a portfolio that answers the pension fund’s objectives with a focus on designing a fiduciary and realistic solution taking into account all factors of the industry. The McGill Challenge required teams to evaluate the case study and submit an online solution in October. The top teams were then selected to participate in the final round in person at McGill University. Each team in the finals presented their portfolio design for 10 minutes followed by a 15 minute Q&A session by a panel of professional judges in the industry. Lynch also received an individual award for public speaking at the final competition in Montreal. She was passionate about the solutions her team put forth, and believes that her passion enhanced her presentation. "I was excited to talk about our ideas, as we had a unique solution for a current problem within the world of finance. I think this excitement shone through in the presentation," she said. Trense said he thought the McGill competition exposed him to an aspect of the market he had not learned about in an academic setting, giving him the opportunity to expand his experiences. The MPIC provided students with practical experience in investing and exposed them to one of the many different investment career paths they could choose to pursue after graduation.